Profound observations and reflections of Buenos Aires and Brazil will have to wait for a bit until I manage to wrap my provincial northern-hemisphere-brain around the experience. Amazing, beautiful, hot, fascinating, at-times-somewhat-disturbing are words that spring to mind. 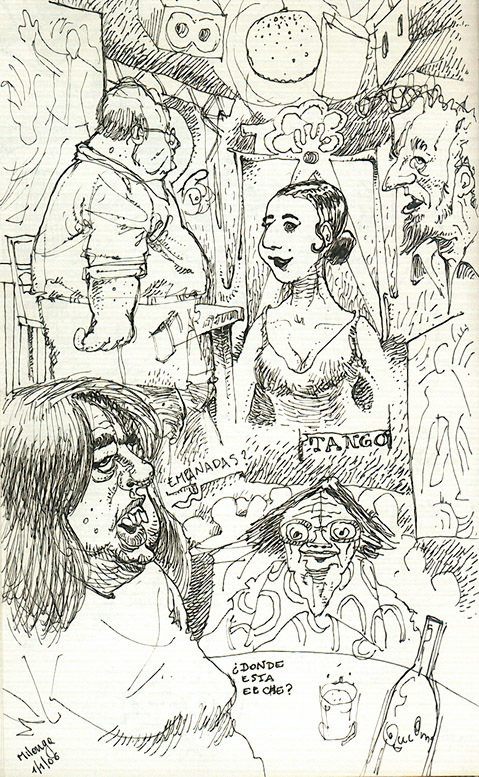 For now: Flickr photos and a sketchbook page. In Buenos Aires we saw Assassination Tango on tv just prior to my first visit to a tango dance hall (they call them "milonga's"). The movie sucked so much (it's basically Robert Duvall promoting his newly wed Argentine wife while impersonating Robert DeNiro) that my expectations had previously jumped below zero. But the place we went to turned out to be beautiful in every way -- a highlight while I was there. This page below does not come close to doing it justice. By the way: the woman that enquires "Empanadas?" really was there. And boy, was she big. Now THAT is one fun journal page! Welcome home.